Finishing off an enclosed canopy couldn't be simpler when you do it with this Caravan 10 ft. Middle Zipper Sidewall. After you have all of the other sidewalls in place (which you have to purchase separately, of course), this convenient zippered panel offers easy access that really completes the enclosure. Once all of the elements are assembled, you can expect to enjoy an area that is protected in a way that you won't often find in the world of portable outdoor shelters. The middle zipper on this sidewall provides convenient entry and exit when you attach it to a 10 foot wall on any appropriately sized Caravan canopy. The sidewall attached easily to the legs and top of the shelter's frame, and there are even zippers along the vertical edges to make attaching to those separately purchase sidewalls quick and easy. You get a variety of color choices, all of the quality construction and safety compliance of other sidewalls and of the canopy top itself, and you get instant access into and out of your tent. This is about as easy as it gets for outdoor shelter owners. The simplicity of operation, the effective function, and the low cost make this a really popular option. 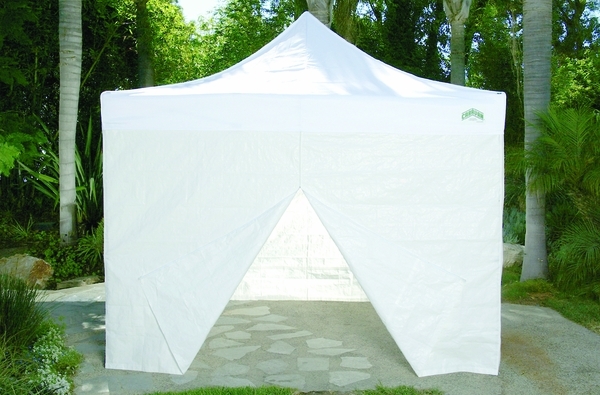 That's why, if you have an existing Caravan canopy with at least one 10 foot wall and you're thinking about adding some privacy or weather-resistance, this Caravan 10 ft. Middle Zipper Sidewall is an excellent choice. WARNING: This product can expose you to chemicals including Diethylhexyl Phthalate, which is known to the State of California to cause cancer, birth defects, or other reproductive harm. For more information go to www.P65Warnings.ca.gov.